USP: It’s verdant with greenary and reverberating with peace. It is designed to appease whoever chooses it as their residence. R.C.C. framed structure to withstand wind and seismic loads. 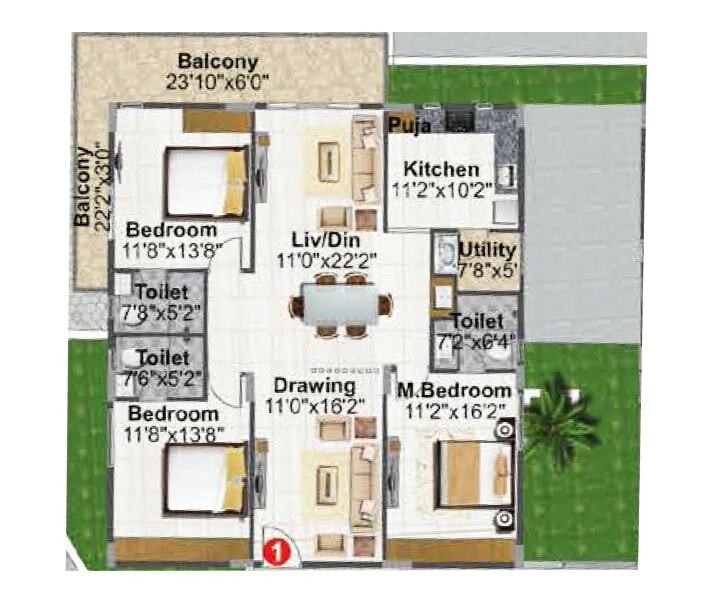 Living, dining, drawing, pooja, all bedrooms and kitchen with double charged vitrified tiles of size 800 x 800mm, balconies and utility with rustic ceramic tiles of size 600 x 600mm, all bathrooms with anti skid ceramic tiles of size 300 x 300mm of reputed make. Corridors / Staircase: Combination – SUPVC – UPVC of granite and tiles. Sound-proof diesel generator of adequate capacity for common area lighting, lifts, motors and 1kw for each flat. Combination of granite and tiles. Concealed copper wiring of Polycab / V-Guard / Havells or equivalent make. External: Textured / smooth putty finish and two coats of exterior emulsion paint of reputed make. Internal: Smooth putty finish with 2 coats of premium acrylic emulsion paint of reputed make. Bathrooms: Glazed ceramic tiles dado up to 7’-0” height of reputed make. Kitchen: Glazed ceramic tiles dado up to 2’ height above the platform of reputed make. Utilities: Glazed ceramic tiles dado up to 3’ height of reputed make. Power outlets for: Air-conditioners in all rooms, geysers in all bathrooms, cooking range chimney, refrigerator microwave ovens, mixer / grinders in kitchen, washing machine in utility area, TV in hall and bedrooms. 3-phase supply for each unit and individual meter boards. All electrical fittings are of Legrand or equivalent make. Main Door: Teak wood frame with designed veneer flush shutter finished with melamine polish and reputed hardware. Internal Doors: Teak wood frame with veneered flush shutter finished with melamine polish and reputed hardware. Toilet / Utility Doors: Teak wood frame with flush shutter with one side veneer and other side enamel paint and hardware of reputed make. Granite platform with stainless steel sink and Provision for water purifier. Sophisticated round-the-clock security / surveillance system. Solar power fencing around the compound. Surveillance cameras at the main security and entrance of each block to monitor. SUPVC windows of Aparna / NCL / LG or equivalent make with clear glass and MS safety grill. Mosquito mesh shall be provided at extra cost. 24-hour water supply is ensured through bore well. Wall-mounted EWC with concealed flush tank of Hindware / Parryware / Cera or equivalent make. All CP fittings are Jaquar or equivalent make. Provision for geysers in all bathrooms. Telecom: Telephone point in living room. Cable TV: Provision for cable connection in living and all bedrooms. Internet: One internet provision in each apartment. Lifts: Kone / Schindler / Johnson make auto-door passenger lifts with rescue device with V3F. Registration Charges, GST and any other taxes applicable as per government norms to be borne by customers only. Surrounded by International Schools, Colleges, Shopping Malls, Supermarkets, Vineyards, Farmhouse, Multiplexes, Hospitals and other urban amenities. Excellent property in Attapur for Builders and people who can afford independent house.